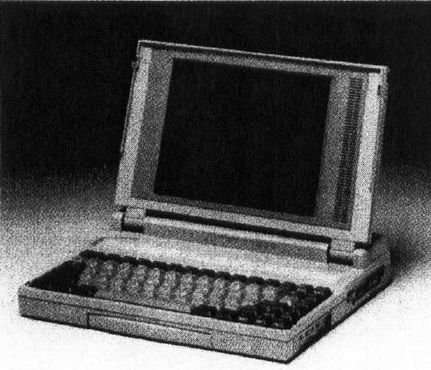 Sanyo's MBC-17NB is the industry's lightest 286-based VGA notebook PC offering an internal 20MB drive and a 3½-inch 1.44MB floppy. Weighing in at only seven pounds, this notebook boasts some heavyweight features, including a large 640 × 480 backlit VGA display, a 12.5-MHz 80C286 CPU, 1MB RAM (expandable to 5MB), LIM 4.0, serial and parallel ports, and an 82-key keyboard. The detachable battery provides two-hour support with a unique one-hour quick charge while the unit is not in use, or you can use a supplied AC adapter. Options include an internal 2400-baud modem, a 2MB RAM expansion card, an external battery charger, an additional battery pack, and a carrying case. The MBC-17NB retails for $2,999. This Sanyo notebook PC has a large 640 × 480 backlit VGA display.